If you’re a snorer, not only can it affect your own sleep, but it could also be affecting your partner’s, and in some cases your entire family’s sleep. Without treatment you could suffer with fatigue, stress and it could be damaging your relationship. The good news is there are many different treatments available and anti-snoring devices are just one of them. Before you invest in any of the devices listed below, it’s worth seeing your doctor to check the cause of your snoring. There are many different causes and some are down to deeper medical issues. You need to rule them out before investing in an anti-snoring device. Snoring Mouthpieces have gained popularity due to their effectiveness. While they aren’t always the most comfortable option, you do get used to them. Some are also designed to be more comfortable than others so it’s worth checking out the full range. They work by pushing your lower jaw slightly forward while you sleep. You typically mould them to your mouth by placing them in hot water before you put them in. The only thing to be aware of with this anti-snoring device is the fact they can cause some side effects. While many people don’t suffer at all, others report drooling, irritated gums, a sore jaw and facial aching. If you do plan on getting one, make sure you check out Free Guide on How To Choose Snoring Mouthpiece That Will Work For You. Did you know that there are specially designed pillows for snorers? These pillows aim to help you sleep on your side. In many cases snoring is completely eliminated when you switch from sleeping on your back to your side. However, with standard pillows it can become quite uncomfortable to sleep on your side. Anti-snoring pillows are contoured in a way that makes them extremely comfortable. There are some anti-snoring pillows that even contain a slightly recessed area in the middle. This helps to prevent your ear from falling asleep while you’re lying on your side. It works by increasing the circulation to the ear while you’re asleep. As well as helping to make it more comfortable to sleep on your side, these are also great for encouraging you to sleep on your front. The one thing to remember with anti-snoring pillows is the fact that they aren’t guaranteed to work. If you lie on your back every night, you might find it difficult adjusting to sleeping on your front or sides. You can buy nasal and throat sprays over the counter at your local pharmacy. They tend to contain both aromatic oils and natural herbs. The ingredients within the sprays aim to relax and lubricate the throat. 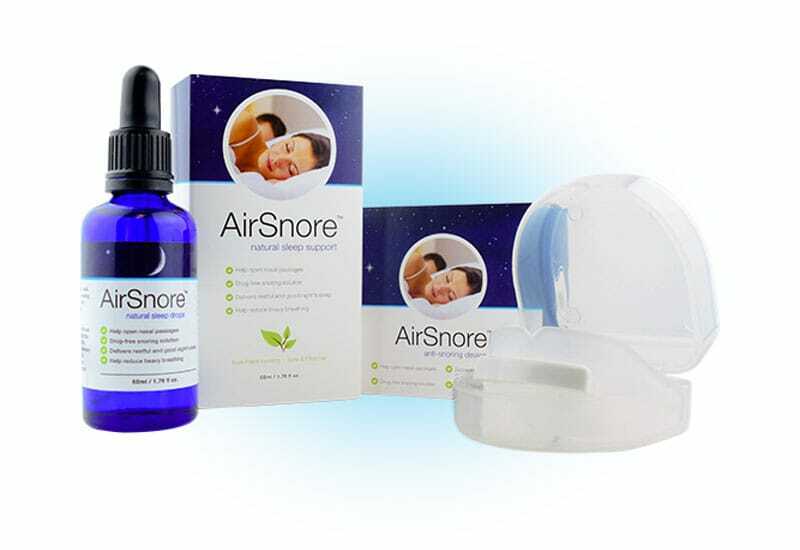 They can also be used to open up the nasal passages, which greatly helps in the reduction of snoring. Whether you’ve bought a nasal or a throat spray, both need to be used right before you go to bed. They are extremely simple to use and require a spray or two (depending on the instructions) either up your nose or in the mouth. Due to the fact that the ingredients found in these sprays are natural, you can use them throughout the night as and when they are required. However, before doing this make sure the ingredients are all natural as some sprays contain other non-natural ingredients too. Chin straps don’t look very appealing, but like mouth pieces they can be extremely effective. If you do sleep on your back a lot, this is an ideal device for you. Holding your mouth closed, this prevents the vibrations you often get when your jaw falls backwards and your tongue obstructs the airway. Your jaw is held in place and your mouth cannot fall open. Prices will vary for this type of device due to the differences in materials used. As with all anti-snoring devices, it helps to take a look at all of your options before choosing one. The slightly more expensive ones might be worth investing in as they are likely to be a lot more comfortable. The small but effective nasal strip is ideal for those who find it difficult to breathe through their nose while they sleep. It opens up the nasal passages, allowing more air to get in and circulate. Footballers are also known to wear these sometimes while they play. This is because the nasal strip opens up the airway, improving running performance. The strips attach to the skin via an adhesive. Some people have reported this to be irritating to the skin. It is possible to find some that are designed to fit in the nose. These reduce the risk of irritation. They are often created with flexible, soft plastic. Finally there’s a cone style device that fits into each nostril. It holds the nostrils open, allowing you to breathe properly. Out of all of the anti-snoring devices, these are definitely one of the weirdest looking options on the market. However, they are also one of the most effective. Short for Continuous Positive Airway Pressure, they are a type of face mask that seal the mouth and the nose. The pressure created on the airway and nasal passages ensures the passages remain open. This anti-snoring device was actually originally created as a treatment for sleep apnoea. It is only available via a doctor. You’ll need to discuss it with your GP to see whether this is the right course of treatment for you. It’s a serious machine that you cannot just buy. One of the lesser common types of anti-snoring devices is the sleep positioning device. This is one of the most effective natural solutions on the market. The aim of the device is to make it uncomfortable for you to lie on your back. Therefore you’ll become conditioned to lying on your side. This eliminates the snoring. While the devices vary, many feature a rubber belt filled with foam. This attaches to your back and it makes it really hard for you to roll over in the night. At first this type of device might take some getting used to. However if you can persevere with it the results will be worthwhile. There are many different sleep positioning devices out there. Some are designed to fit between your legs, while others o behind your back. Shop around for the best one to suit your preferences. Overall these are the main types of anti-snoring devices available out there. It’s worth taking into account their advantages and disadvantages before choosing the right one for you. It’s also a good idea to know exactly what the cause of your snoring is before you work out how to treat it.